For as long as there has been web hosting, there has been email hosting tacked on to it. It is free, convenient, and a bad idea. It’s hard to pass up a free service, but let’s look at a few reasons why you shouldn’t. If your website goes down, so does your email - Every host, even the most reliable ones, occasionally experience downtime. When (not if) you have downtime, your email will go down, too. That means you will miss important email when you need it the most. If you can't afford to miss emails, you can't afford to host your email on your website host. If your website host server's IP address changes you could end up on a spammer list - It's inevitable. Website servers are computers and need to be upgraded. Sometimes this involves changing the IP address of the server. When this happens, the IP address associated with your email also changes. If the new IP happens to be on a SPAM list, the emails you send may get bounced back to you. Forwarding emails - For a while, we tried to stop people from forwarding email accounts on our server. Why? Because when you receive spam and forward it to an outside email address, you then become the spammer because you are sending spam. So on a shared server, everyone that shares the same IP address for their email shares the same email reputation. With a dedicated email service provider, forwarding emails are allowed because they a robust system that deals with spam effectively. Too much spam - Free email service packaged with your hosting account has limited spam filtration tools. 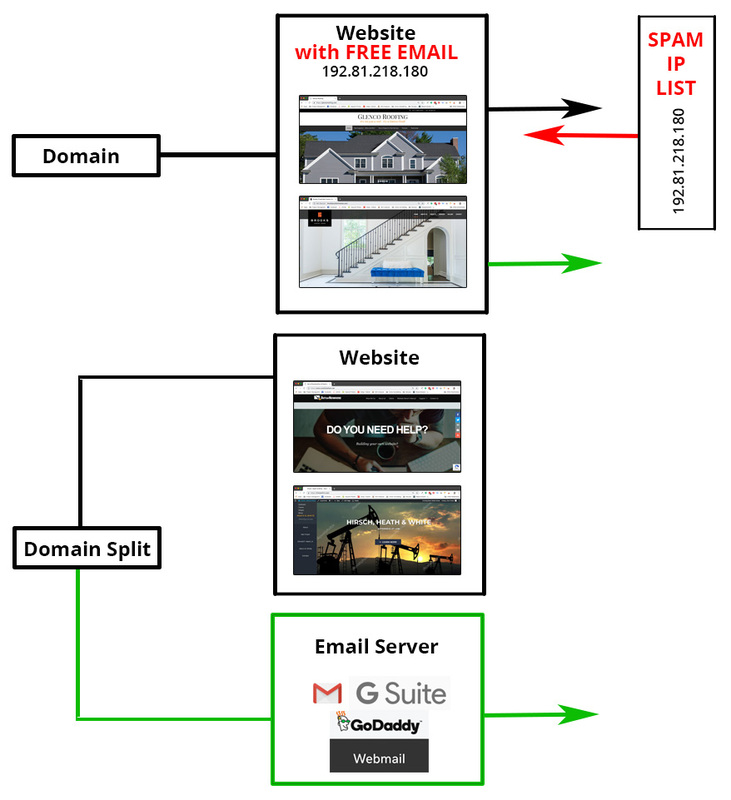 Dedicated email service providers are built on a foundation of good spam control. Limited disk space for saving emails online - A hosting account can only offer a limited amount of space to save emails on the server. A dedicated email service provider, however, will offer you an abundance of space to save email online. This is where we host our email because it’s a terrific solution. You get email @yourdomain (plus a lot of other stuff) for just $5-$10/email/month, depending on the plan you select. Both plans are good options. You can sync your email actions across all of your devices which important because most likely, you’ll use email on your phone and your computer. You can’t beat their SPAM filtering technology. G-Suite can be a bit challenging to navigate. But… they offer great phone support to walk you through anything that is confusing. You get email @yourdomain, plus a few extras for the first year. They offer three email plans which differ mainly on the number of email addresses included, the amount of storage you are allowed, and the protocol for managing your email between devices (computer, phone, tablet). As much as we don’t like recommending the most expensive option (Email Ultimate Business), in this case we do. The main reason is it’s the only option which allows you to sync your email activity across all devices. Their system is less complicated than Google’s. But… their customer service isn’t quite as good as Google’s. If you want more than one email account, this is less expensive.